Note: As shown by the asterisk, the lifting load limit of the AGE56-12 at a minimum height of 3.8 m is 50 kgf. 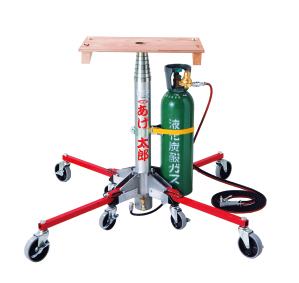 Use a compressor or carbonic acid gas cylinder for power supply. The Agetaro plays an active part in the following applications. Lightweight, compact, and easy to carry. Incorporates a relief valve for comfortable work. No running cost (with a compressor used). Reduction of make-ready time on site. Used with ease and highly effectively at high positions including wall sides. 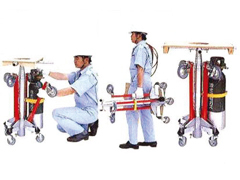 Incorporates a control grip that enables the operation of the lifter while checking the discharge and stop positions of the lifter, thus ensuring high-precision work. 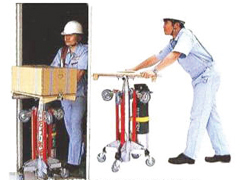 Provided with casters for ease of movement during work. 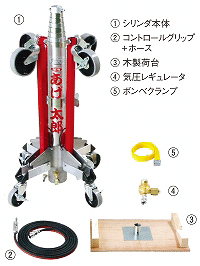 The legs can be folded without unloading the bottle from the lifter. 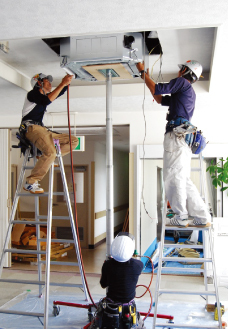 Ease of movement in narrow places and factories. Folded at the flip of a switch and stored in any place. The lifting force (150 kgf) is 5 times as high as the own weight. Optional parts for each site are available. For details, contact your Sanyo Kiki representative. Do not stand on the pneumatic lifter. Refrain from using CO2 gas cylinders as much as possible for the protection of the global environment. Be sure to maintain the machine sufficiently. 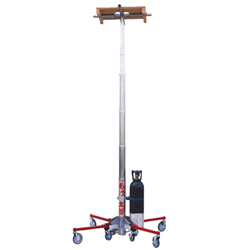 The pneumatic lifter is provided with product-liability insurance.